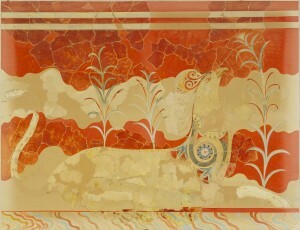 Reproduction of the “Bull Leapers” fresco (detail) from Knossos by E. Gilliéron, père (1906); original ca. 1425–1300 B.C. Reproduction of a terracotta stirrup jar from Gournia by E. Gilliéron & Son, ca. 1914; original ca. 1525–1450 B.C. 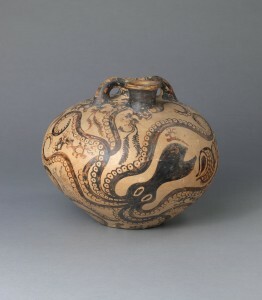 The art of the Greek Bronze Age is an intoxicating blend of reality and fantasy: colorful depictions of wide-eyed octopuses, craggy landscapes, well-endowed goddesses, mythological beasts, and millennia-old rituals abound on amulets, frescoes, jewelry, seals, vases, votive statuettes, and weapons. It’s hard to imagine a time before these exhilarating works—products of the great Minoan and Mycenaean civilizations but influenced by cultures spanning from the Middle East to India—were known to the modern world. But as recently as the late 19th and early 20th centuries, these treasures were still ensconced deep in the earth, awaiting discovery. Historic Images of the Greek Bronze Age: The Reproductions of E. Gilliéron & Son, a yearlong exhibition at the Metropolitan Museum of Art, transports visitors back to the days when archaeologists first started buzzing about the existence of a “preclassical” Greece. On display are 60 detailed reproductions, fashioned to scale, of some of the most famous artifacts to be unearthed from sites such as Knossos, Mallia, Mycenae, and Tiryns. Created a century ago, these objects are now practially “artifacts” in their own right—records of early archaeological and museological practice. They are the handiwork of a Swiss father-son team who shared the same name, Emile Gilliéron (differentiated in the Met’s show as père [father, 1850–1924] and fils [son, 1885–1939]), and had a surprisingly profound influence on how these works were perceived by worldwide audiences. Reproduction of a fresco with a griffin from Knossos by E. Gilliéron, père (1910); original ca. 1450–1300 B.C. The duo worked closely with prominent archaeologists such as Sir Arthur Evans, the father of Minoan archaeology, to resurrect these fragmentary images as they emerged from the ground. The Gilliérons then made high-end, precise copies of the artifacts for sale to museums around the world, including the Met. In the days before cheap travel and social media, such collections of “genuine fakes” were invaluable resources to students, scholars, and the general public alike. Key to the success of identifying and commissioning such newly unearthed artifacts was Gisela Richter, curator in charge of the museum’s Department of Greek and Roman Art from 1925 to 1948. Each year, the widely published scholar spent three months in Greece. “She’d hear about a discovery and request a replica of it for the museum,” says the show’s curator Seán Hemingway. “What’s interesting is that archaeologists would give their permission to have the copies made.” Evans, for example, gave his permission with the understanding that the objects wouldn’t be published before he published them, but that they could be displayed so people could see what was being found. A black-and-white photograph in the exhibition shows how the Met’s “Gallery for Prehistoric Greek Art” looked in 1933. “Most of the objects in this picture were reproductions,” says Hemingway, who points out that the copies were clearly labeled as such. One wood-and-glass display case in the photo, which holds a replica of the Agia Triadha sarcophagus, was actually dusted off and reused for the same purpose in the present show. “We even used to have the Lion Gate from Mycenae,” he adds. “It’s just amazing.” In subsequent years, the Met started acquiring real Bronze Age artifacts, so many of its reproductions were sold, given away, and lent out to fellow institutions. Even so, the museum still has hundreds of others squirreled away in storage. 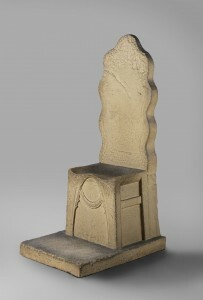 Reproduction of the “Throne of Minos” from Knossos (ca. 1906); original ca. 1700–1425 B.C. Although aspects of some of the Gilliérons’ works, like the border of the Bull Leaper’s fresco from Knossos (top banner; border not pictured), have since been tweaked with the help of additional discoveries—and scholars have scrutinized and debated the details of countless others—it’s amazing how these images have endured. In fact, the fresco copies that still hang on the walls of the actual palace at Knossos on Crete, giving visitors a lasting impression of the whimsical art roughly in situ, were more than likely made by the two as well. 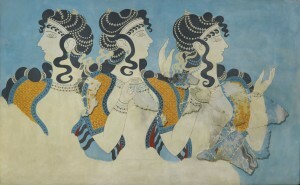 Reproduction of the “Ladies in Blue” fresco from Knossos by E. Gilliéron, fils (1927); original ca. 1525–1450 B.C. See a related article by Seán Hemingway on the Met’s website. “Historic Images of the Greek Bronze Age: The Reproductions of E. Gilliéron & Son” is on view at the Metropolitan Museum of Art through June 17, 2012. This entry was posted in Europe and tagged archaeology, Bronze Age, Crete, Emile Gilliéron, Greece, Knossos, Metropolitan Museum of Art, Sean Hemingway. Bookmark the permalink.